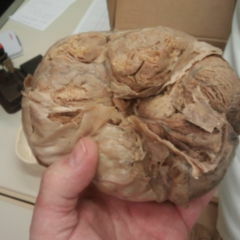 Dura mater is the outermost part of the meninges that encapsulate the brain, effectively separating it from the skull. Both parts of the dura merge in the foramen magnum. Anterior meningeal artery, a branch of the anterior ethmoidal artery. Middle meningeal artery, emerging from the maxillary artery (mandibular part). Posterior meningeal artery, of the ascending pharyngeal artery (medial branch of the external carotid artery). 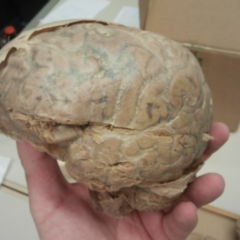 Falx cerebri and cerebellar tentorium – which partition the brain – are duplications of the cranial dura mater. The venous cranial sinuses run along the edge of the cranial dura. and branches of the maxillary, mandibular and vagus nerves. The dura mater consists of tough collagenous connective tissue which is covered with low epithelium on its inner surface. The subdural space (or subdural cavity) separates the dura from the underlying arachnoid mater. 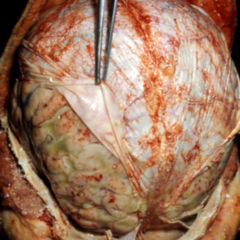 In the healthy brain this cavity is partially filled with connective tissue but as a result of traumatic brain injury, it can be filled with venous, and sometimes arterial blood. This leads to increased pressure on deeper-lying parts of the brain. 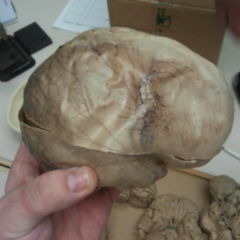 This subdural hematoma has to be surgically relieved to prevent long-term damage to the brain.